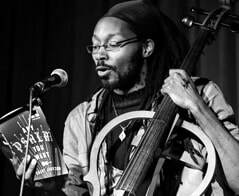 ​Khary Jackson​ is a poet, playwright, dancer and musician. He is an alumnus of Cave Canem, the esteemed writing fellowship for black writers. He has written 12 plays, one of which (Water) was produced in 2009 at Ink and Pulp Theatre in Chicago. He has been a recipient of several grants, including the 2016 McKnight Artist Fellowship in Writing, the Minnesota State Arts Board’s 2012 Cultural Community Partnership Grant and 2010 Artist Initiative Grant for Poetry, as well as the 2009 VERVE Spoken Word Grant from Intermedia Arts. His first poetry book, Any Psalm You Want , was published with Write Bloody Publishing in the spring of 2013.